Consumers are looking for deals. They are clipping coupons at an increasing rate. So why are retailers not getting the same sales lift they once did? 1. What kinds of tactics cause this fatigue? FSIs, TPRs, displays and features are mentioned because they are legacy spray and pray vehicles. But digital offers used excessively are also culprits, according to Gregg Ambach of Analytic Partners. Mass email in particular desensitizes shoppers. We’ve found lowering frequency of delivery, carefully selecting which offers to include, and shorter expiration periods all improve response. 2. What kinds of shoppers experience this fatigue? Mostly, those who are bombarded with irrelevancy. Analytics applied to individual purchase history, mass response and cross-category patterns grow incremental lift and improve shoppers’ self-reported satisfaction. Furthermore, analytics applied to individual promotion history tells us which shoppers are the deal enthusiasts who don’t generate incremental lift. 3. What kinds of offers contribute to fatigue? 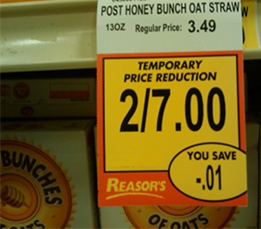 Often, it’s the glaring sameness of discounts. Instead, providing brand news, new usage occasions, seasonal relevance, and multi-product solutions all contribute to brand utility and equity. So does recognizing loyal shoppers or brand buyers apart from average shoppers with a thank you message and tailored offers.